Help save money, trees, and time. 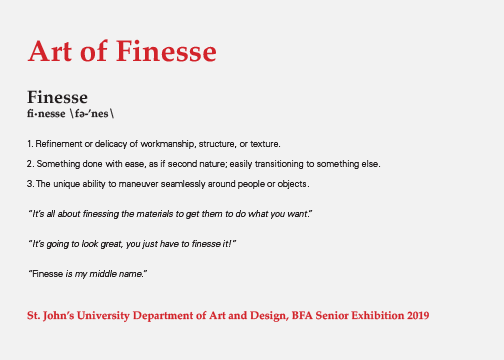 The Department of Art and Design is proud to announce the opening of the Art of Finesse, the Department’s 2019 Senior Exhibition, featuring work from Thesis Seminar and Senior Design classes. This exhibit is hosted and made possible through the cooperation of Dorsky Gallery Curatorial Programs (DGCP) in Long Island City, marking a nine-year-long partnership between Dorsky Gallery and St. John’s University. The aesthetically and conceptually accomplished Thesis Seminar work in the Art of Finesse employs diverse creative techniques and strategies that range from photography, web design, video, illustration, printmaking, painting, and sculpture. One of the formal themes that emerges in this exhibition is the artists’ embrace of technology, not as an end in itself, but as a tool to be leveraged in concert with more traditional ways of making objects and images. The result is a multidisciplinary exhibition that explores the artists’ relationships to the natural world, intimacy, music, light, color, and history. Students in Senior Design focus on developing a product or service in response to the challenge of whether a design intervention could benefit a particular market sector and/or act as an agent of change. They then build a number of designed outputs to help realize their ideas.